Drawing on the much-loved British brand’s 55 years of proud motorsport heritage, it is the most powerful production MINI ever. Its 2.0-litre MINI TwinPower Turbo four-cylinder engine delivers 231 hp and 320 Nm of torque. Competition expertise has been put to good use in the design of the engine, suspension, brakes and aerodynamics. 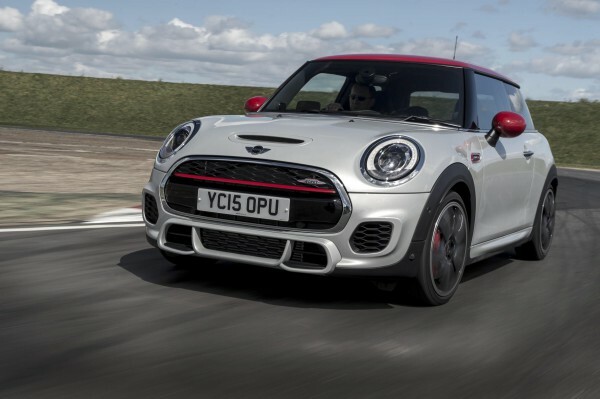 The exterior styling and interior trim also benefit from motorsport influence and distinguish the John Cooper Works as a model in its own right, totally distinct from the MINI Cooper S, while the sports exhaust system delivers a rich racing-inspired sound. The figures alone mark the new John Cooper Works out as the sportiest MINI ever to be offered for sale. Acceleration from 0-62 mph takes just 6.3 seconds with the six-speed manual transmission – an improvement of 0.2 seconds, or three per cent, over the previous model – and an even more rapid 6.1 seconds with the optional six-speed Steptronic sports automatic gearbox, which includes Launch Control. Driving flexibility and overtaking prowess have also been emphatically sharpened thanks to the 320 Nm of torque: acceleration from 50 to 75 mph is completed in 5.6 seconds (manual gearbox), a 10 per cent improvement over the previous model, and a time which puts many sports cars in the shade. With either transmission the top speed is 153 mph. All of this has been achieved with the exemplary efficiency made possible by MINIMALISM fuel-saving and emissions-reducing technologies, which are a feature of every model from MINI. With the manual gearbox, the new John Cooper Works has combined fuel consumption of 42.2 mpg with CO2 emissions pared to 155 g/km. With the automatic sports transmission there are even more spectacular improvements of almost 20 per cent over the previous model, with figures of 49.6 mpg and 133 g/km. Ever since legendary designer and performance specialist John Cooper, discovered the sporting talent of the classic Mini, his name has stood for maximum driving enjoyment and impressive competition success. The link between MINI and John Cooper Works is steeped in tradition, which is reflected in the latest engine to appear in a model bearing his name. This, the most powerful unit to appear in a production MINI, is a transversely mounted four-cylinder engine which exhibits the latest advancements in power delivery, smoothness and efficiency. It features MINI TwinPower Turbo technology to deliver performance characteristics with unambiguous motorsport links. The 2.0-litre capacity (1,998 cc) engine of the new John Cooper Works has a maximum power of 231 hp, available from 5,200 to 6,000 rpm – 10 per cent greater than the previous model – while the peak torque of 320 Nm, available from just 1,250 to 4,800 rpm, represents an improvement of 23 per cent. The engine was newly created for the latest MINI Cooper S, but for the MINI John Cooper Works it features a specially developed turbocharger integrated into the cast-steel manifold, direct fuel injection via injectors mounted centrally between the 16 valves and modified VALVETRONIC fully variable valve control and double VANOS variable camshaft control on both the intake and exhaust sides. Large air inlets have been added to the front apron of the new MINI John Cooper Works to meet the additional cooling requirements of the 2.0-litre Twin Power Turbo engine. The location of the turbocharger allows for short ducting for the exhaust gas flow, which ensures quick and early response that is reflected in the sporty driving characteristics of the model. It generates increased charge-air pressure for an even power delivery over a wide rev range. The pistons have been harmonised to enable compression reduction adapted to the high level of charge-air pressure, ensuring power delivery which starts early and is maintained throughout the rev range. Similarly, the high level of widespread torque allows spontaneous response to the smallest movement of the accelerator, ensuring rapid thrust from standstill and instant, rapid acceleration on the move. This is complemented by a sports exhaust system which not only generates low back-pressure for more instant response, but also produces emotional motorsport-inspired sounds typical of MINI John Cooper Works models. Power is transmitted to the front wheels through a choice of six-speed sports gearboxes specifically adapted to the engine’s performance. The standard manual transmission is characterised by low weight and a short-travel shift to increase acceleration. As with the MINI 3-door hatch, the manual transmission features automatic rev matching technology, meaning that when down changing, the engine revs are automatically matched to the wheel speed, creating smoother downshifts with an automatic “heel and toe” effect. The optional Steptronic sports automatic transmission can also be operated manually by gear change paddles on the steering wheel. This allows extremely fast shifts with the maximum of efficiency and comfort. When in this mode the driver also has full control over the gear change as there is no forced upshift. Equally there is no automatic kick-down for overtaking. All versions of the MINI John Cooper Works have automatic engine stop/start so that fuel consumption and emissions are completely eliminated when the car is at standstill in traffic. This is just one of the MINIMALISM technologies applied to the MINI John Cooper Works to ensure that extreme performance is not accompanied by high consumption and emissions. Other MINIMALISM technologies include a shift point display advising the driver of the ideal time to change gear; recovery of energy normally wasted as heat when decelerating and braking to top up the battery; use of the fuel pump, coolant pump and other engine ancillaries only as necessary; an electromechanical power steering system which draws energy from the engine only when turning; and a map-controlled oil pump. Lightweight construction and carefully honed aerodynamics also add to the driving enjoyment and overall efficiency of the new MINI John Cooper Works, which weighs no more than its predecessor when its additional size and equipment have been taken into account. The new MINI John Cooper Works takes the renowned go-kart agility which has always been a MINI hallmark to an even higher level with a bespoke sports suspension system and exclusive 17-inch light alloy wheels, while race-tuned Brembo sports brakes endow the car with the stopping power to match its high performance. The third-generation MINI hatch already exhibits class-leading levels of agility and stability thanks to its low centre of gravity, short overhangs, wide stance and rigid body structure, but for the John Cooper Works the single-joint spring strut front axle and multi-link rear axle have been completely retuned to give the car an even more thrilling drive. To reduce unsprung weight and increase rigidity, the front axle of the MINI John Cooper Works features aluminium swivel bearings and high-strength steel axle supports and wishbones. Bespoke axle kinematics increase turn-in response and steering precision while eliminating torque steer. High-strength steels are also used in the rear axle to trim weight while increasing stiffness. Tube-shaped anti-roll bars, an innovative axle bearing which includes a hydraulically damped engine mount and triple-path support bearings to de-couple the dampers from the body enhance the direct, precise handling while ensuring that the ride always remains supple and comfortable, even when the car is being driven in a particularly sporty manner. John Cooper Works 17-inch light alloy wheels with a Race Spoke design are standard, and 18-inch John Cooper Works light alloy wheels with a Cup Spoke design are optional. High-performance four piston fixed-caliper front disc brakes have been developed with specialist racing brake manufacturer, Brembo. These 330 mm front discs ensure consistently high stopping power even during track use. The brake calipers are finished in red and carry the John Cooper Works logo. Electronic driver assistance features include Dynamic Stability Control (DSC) and Torque Steer Compensation. The DSC system which, while fitted as standard is capable of being fully disconnected if required, incorporates Dynamic Traction Control (DTC), Electronic Differential Lock Control (EDLC) and Performance Control, which improves agility when taking bends at speed. Torque Steer Compensation is coupled with a specially developed split driveshaft design, to eliminate any tendency of the car to self-steer when the front wheels are rotating with differing levels of engine torque. The design uses an intermediary shaft to deliver drive to the far driveshaft, meaning both end shafts are the same length. This design not only reduces torque steer but is also more compact, as the intermediary shaft needs no room to move vertically, contrary to a two shaft set-up where the longer shaft is expected to move with the wheel. Variable Damper Control, which allows the driver to select more sports-oriented or more comfort-biased suspension characteristics, is optional. It modifies the stiffness of the suspension damper by increasing or decreasing the amount of oil used to damp cornering action, reducing body roll and increasing road holding in Sport mode. The drive handling of the MINI John Cooper Works is supported by its extremely rigid body structure and this also has a strong influence on passive safety. The integrated MINI safety concept includes optimised deformation zones, six airbags, three-point belts for every passenger and ISOFIX child seat attachments in the rear, while a partially active bonnet adds to pedestrian protection. This safety can be further enhanced with the addition of the Driving Assistant pack. A front mounted camera monitors the road ahead adding key information in the form of: Rear end collision warning, Pedestrian recognition, High beam assistant, Traffic sign recognition and Active Cruise Control. The Driving Assistant pack was recently awarded an Advanced Safety award by EuroNCAP. The unique look of the new MINI John Cooper Works is the result of practical considerations as much as aesthetics. Enlarged front air intakes and an additional air inlet in the near-side outer area of the front apron where the fog lights would normally be housed have been added for extra cooling. These additions along with the sports brakes, give an immediate clue to the sporting prowess of the most powerful production MINI ever. The hexagonal radiator grille has a honeycomb centre and a red blade as well as bearing the John Cooper Works logo. This logo is replicated on the boot lid. LED headlamps are standard and are surrounded by LED daytime running lights incorporating the direction indicators. Aerodynamic additions to the MINI John Cooper Works include new ducting elements in the front apron, bespoke side sills, a rear apron with flaps and a diffuser containing the wide twin tailpipes of the sports exhaust system, and a rear spoiler. Other exclusive design features are side indicators with a red inlay and a John Cooper Works logo. The new MINI John Cooper Works is available in 11 body colours, including the new Rebel Green metallic which is exclusive to this model, as well as and MINI Yours Lapisluxury Blue metallic which is a new addition to the range for all 3 and 5-door hatch. Also exclusive to the MINI John Cooper Works is the no-cost option of a Chili Red roof and mirror caps, and optional John Cooper Works bonnet stripes. The roof and mirror caps can also be finished in white or black at no extra cost. Drivers of the new MINI John Cooper Works are left in no doubt as to the car’s sporting pedigree from the moment they open the door. There are new body-hugging John Cooper Works sport bucket seats with integrated headrests in Carbon Black Dinamica/fabric or optionally, Carbon Black Dinamica leather. These are complemented by the John Cooper Works-logoed door sills, leather John Cooper Works multi-function steering wheel and gear selector for automatic transmission, both featuring Chili red stitching, stainless steel pedals and footrest, and an anthracite headliner. Interior trim in Piano Black – with red accents on the seats, steering wheel rim, gear selector and central instrument surround – underscores the sporting credentials of the MINI John Cooper Works, and there are new, exclusive instruments. The speedometer has a dark dial to improve readability and minimise the time the driver’s gaze is averted from the road or track. The controls of the MINI John Cooper Works include the MINI Driving Modes switch, which allows the driver to vary the accelerator response, engine sound and – depending on the options chosen – the gearshift points of the automatic transmission and the Variable Damper Control mapping. A rotary switch at the base of the gear selector adjusts the settings from the standard MID Mode to either SPORT or GREEN. It is therefore possible to drive to a track with the car in its most efficient mode, switch to the most dynamic settings for circuit use then revert to maximum efficiency for the journey home. Unique driver assistance functions and a range of high-end features, including full connectivity via MINI Connected and MINI Connected XL, emphasise that the new MINI John Cooper Works is the most premium of small high-performance sporting hatchbacks. For the John Cooper Works, the optional MINI Head-Up Display which extends above the steering wheel contains additional information. Besides the usual display of road speed, speed limits, overtaking restrictions, navigation directions, Check Control messages, feedback from the driver assistance systems, telephone contacts and entertainment programmes, the driver can also be informed of the engine speed, with a graphic building to indicate when the car is approaching the redline and rev limiter. With automatic transmission the currently selected gear is also displayed. The MINI Head-Up Display therefore helps sporty drivers to extract maximum performance with the minimum distraction. The interior content of the new MINI John Copper Works can also be supplemented with optional sports instruments – three classic circular dials which provide essential information to drivers who intend to enjoy track days. There are oil pressure and boost pressure displays plus a chronometer with stopwatch, which sit in place of the optional Head Up display. Owners can also add Parking Assistant with Park Distance Control and a rear-view camera to the already full list of standard driver assistance functions. In addition to the specific MINI John Cooper Works model features, the standard equipment includes an engine scoop in body colour, a distinctive chrome-plated fuel-filler cap linked to the central locking system, two-way steering column adjustment, air conditioning, heated mirrors and windscreen washer jets, electrically operated front windows, an engine start/stop button, a DAB radio, Bluetooth mobile phone connectivity for hands-free operation and cruise control with automatic braking on downhill gradients and Curve Speed Limiter. The level of connectivity can be extended by the MINI Connected or MINI Connected XL systems, in conjunction with the Visual Boost Radio or Media Pack respectively. These offer extensive integration of Apple and Android smartphones, allowing the use of internet-based infotainment, navigation and communication services plus social media, and provide Real-Time Traffic Information, with highly precise and constantly updated details of hold-ups on the planned journey. The system is intuitive and operated by a controller in the centre console linked to a colour display in the dashboard. With the MINI Navigation System XL the central display measures 8.8 inches and is operated by the MINI Touch Controller with a touch-sensitive surface. Another optional feature is MINI E-Call to give automatic access to Intelligent Emergency Calling in the event of an accident and MINI Teleservices vehicle condition monitoring. Other options for the new MINI John Cooper Works include double-zone automatic air conditioning, a panoramic electric glass sunroof, heated driver’s and front passenger’s seats, rain sensors and automatic headlight activation, a 12-speaker Harman Kardon audio system and a huge range of customisation and personalisation features. The John Cooper Works is available with the MINI Chili pack, a bundle of optional equipment which can be purchased at a significant saving compared to ordering the equipment separately. In addition to a saving on the purchase price of the car, like all of MINI’s core packs, the Chili pack can significantly increase the residual value of the car, translating into a saving both at point of purchase and point of sale.